Plants are not difficult to grow indoors. Most people make it hard however by doing too much. The sins of improper house plant growing include picking dark locations, applying too much water, using the wrong kind of fertilizer or using too much fertilizer of any kind. I once watered indoor plants too much myself. Most people do. During the spring and summer, most inside plants need water less often than weekly watering– exactly how often to water you’ll have to determine yourself. The schedule will depend on light, plant types and air conditioning/heating. I have learned the hard way that most interior plants can stand, in fact like, far less water and fertilizer than most homeowners give. Periods of completely dry soil are actually good for most interior plants. During the winter months water even less and fertilize very lightly on a monthly basis at the most and in most cases and don’t fertilize at all. Some interior plants obviously require more water than others and they rarely need much fertilizer. They never need strong fertilizers like Miracle Gro or Rapid Grow. What I normally use myself and recommend to others is gentle organic fertilizers like earthworm castings and compost tea. 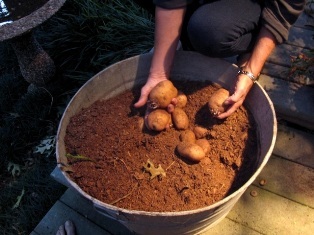 Synthetic fertilizers force feed the plants build up residues in the soil. Organic fertilizer feeds the soil gently and doesn’t cause any problems. I don’t recommend watering potted plants from the bottom. Clean water is important. Filtered water is the best for plants because it doesn’t have the chlorine and fluoride found in most city water. If filtering isn’t possible, add 1 ounce of apple cider vinegar per gallon of water. Wash the windows and the leaves of the plants regularly to keep the photosynthesis (food making) of the plants as active as possible.